Of all the things we experience in life, there are few more frustrating than a cough. At first, we hope it will last for just a couple of days before then disappearing. After several weeks, this is the time you should go to see a doctor because your body is telling you something. With coughs caused by viral infections or an upper respiratory infection should disappear within a week. Any cough that lasts longer than a week, a chronic cough, suggests an underlying health condition. Of course, this could be asthma, which is a common issue, but there’s another health problem we’re starting to learn more about as time goes on: sinusitis. According to various ongoing studies and research, we now know that sinusitis is a bigger problem than we first thought. In fact, back in a 2005 Mayo Clinic study, at least 33% of all chronic cough sufferers were suffering from sinusitis (some form of inflammation of the sinuses). In the twelve years since then, this number has increased, but there are now solutions available. If you’re wondering why this inflammation causes a cough, it comes from what we call ‘postnasal drip.’ Here, your sinuses will produce too much mucus to be of any use so some will drip backward into the throat and this triggers the cough reflex. In the medical world, this has a name of its own; upper airway cough syndrome (UACS). As a side effect of having sinusitis, this creates the link with your chronic cough, meaning you need to treat the sinusitis before anything else. If left untreated, the cough will keep returning time after time. While on the topic, we should also discuss allergic rhinitis (inflammation concentrated in the nose). It’s caused by allergens such as mold, pollen, and dust mites. 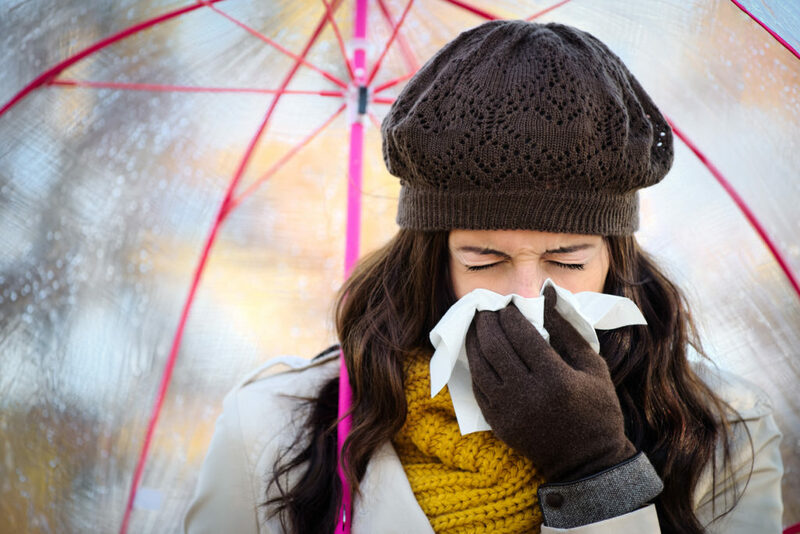 With millions of people suffering from allergies in the US, this is now a huge issue and it just so happens that postnasal drip is a symptom of the problem. As we know, this will soon lead to a chronic cough which persists until you receive treatment. Generally speaking, patients with sinusitis and rhinitis-related coughs experience a worsening of the symptoms when the sun goes down. Since we go to bed and lie down to get some rest, this horizontal position can cause a disruption in the throat which makes sleeping somewhat difficult. Furthermore, we normally have something else to focus on throughout the day. When we’re trying to go to bed, we tend to concentrate on the things that are preventing us from resting, and this places all the emphasis on the cough. Seek professional treatment for a chronic cough as soon as you can, as these symptoms often point to more serious health concerns, such as asthma and sinusitis. As mentioned before, treating the cough alone in these situations is a little pointless because it won’t be long before postnasal drip brings it back again. Therefore, you need to consider tackling the cause of the issue which is the sinusitis. If you’ve been experiencing the symptoms for more than 12 weeks, you’re now past the ‘acute’ phase and are progressing into the ‘chronic’ phase. At this stage, antibiotics aren’t likely to act fast enough, which is why some form of therapy may be required. Treatment options include including anti-inflammatory nasal sprays and the like. If the problem persists and starts to affect your life dramatically, you should see your doctor for a consultation for balloon sinuplasty. How balloon sinuplasty works: after inserting a small camera into the nasal passage, a balloon is then sent up before being inflated. This inflation procedure works similarly to opening blocked arteries during heart surgery. Compared to more traditional options, this is less invasive and will only see you out-of-action for a couple of days. From here, you can then treat the chronic cough (if it still exists) as you would a normal cough. Safe in the knowledge the postnasal drip has stopped, you can treat the cough without worrying about it returning anytime soon. Ultimately, you know your body better than anybody else. Only you know when the cough is unusual in duration and severity. If you pay attention to the length of a cough, by marking it on the calendar, you’ll soon learn the right time to see a medical professional and find the underlying issue.